In recent years, my family has discovered that multi-generational travel is the absolute best. Multi-generational travel is a chance for mom, dad, kids and grandparents to explore, have fun and reconnect as a family. In practice, traveling with both kids and grandparents can pose some challenges. Different schedules and interests can make it difficult to plan a trip that the whole family can enjoy. Last month I worked with Carnival, and my family discovered that going on a family cruise is totally the way to go. Cruising is such an easy way for grandparents and kids to travel together. 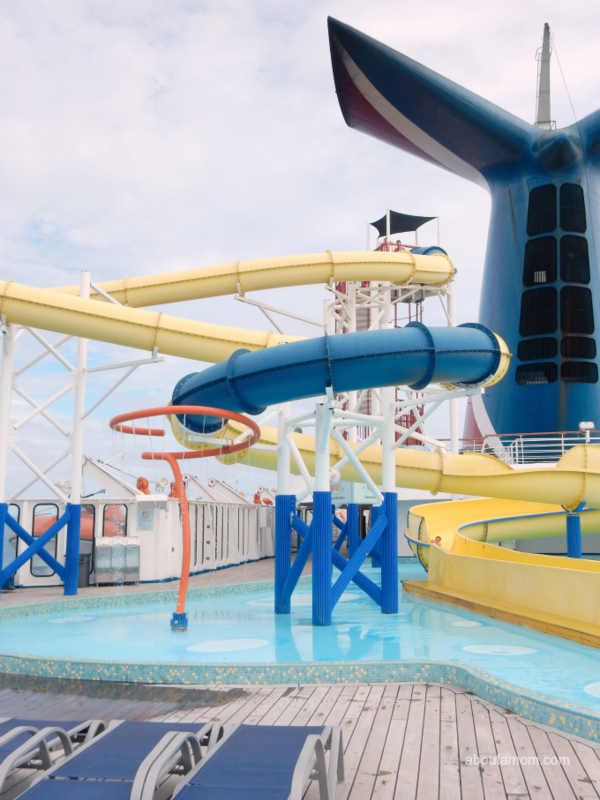 Our ship, Carnival Ecstasy, had an incredible amount of activities that the whole family could enjoy. I thought it would be fun to share some of the things that grandparents and kids can do on a cruise. Most grandparents don’t have the opportunity to enjoy mealtime with their grandchildren on a regular basis. 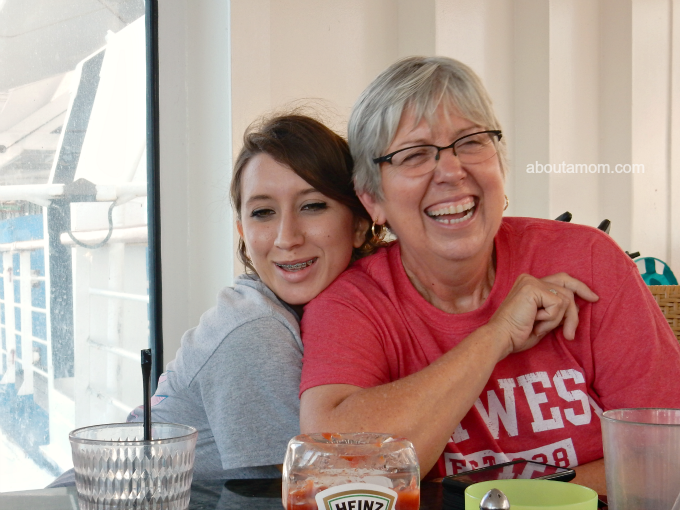 One of the things we enjoyed the most on our cruise was having mealtime together as a family each day. From the more formal dining room to the buffet, or burgers and fries poolside, there a lot of different meal options available. Carnival has a great variety of kids menu choices, making it easy for grandparents and kids to enjoy mealtime together. We spent quite a bit of time by the pool on our cruise. Ecstasy had two different pool areas, and we especially enjoyed the pool that was geared toward kids. It had side-by-side racing slides and a big twister waterslide. The girls convinced their grandmother to go down the twister slide and she loved it! By the larger pool we found a ping pong table and a shuffleboard court. 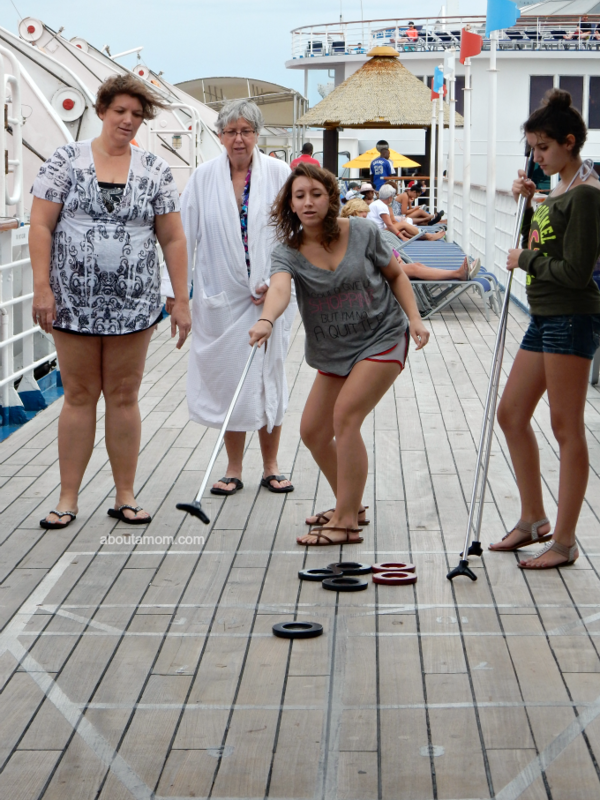 Grandma Debbie was excited to instruct the girls in their first game of shuffleboard. I would have never guessed that we would have so much fun playing shuffleboard. There was a very cool miniature golf course up on the top deck of the ship. It was the perfect afternoon activity for all three generations of our family to enjoy. No matter where your ship docks, you are sure to find a great excursion that both grandparents and kids will enjoy. We spent one day at the beach in Cozumel. Grannie and the girls really enjoyed spending time in the ocean looking for sea creatures. Our ship also made a stop in Key West, Florida. We had a great time walking through the historical city, all the way to the southernmost spot of the continental United States. 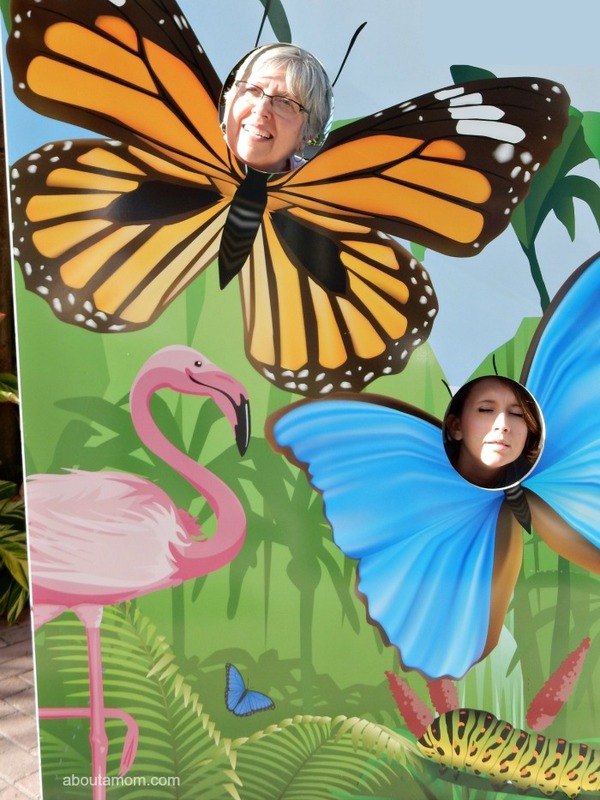 Along the way we stopped at the amazing Key West Butterfly and Nature Conservancy where Grannie and Becca paused for a goofy picture. There are some great family-friendly shows for grandparents and kids to enjoy on Carnival cruise ships. Our ship had a great kid-friendly comedy show in the afternoon. There was also a fantastic broadway style stage show that we really enjoyed, and since we cruised so close to the Christmas holiday, the crew put on a holiday show that included the children who attended Camp Carnival. It was so sweet. Speaking of Camp Carnival, just in case grandparents need a short break from the kids, Camp Carnival offers great youth programs for kids ages of all ages. There are also some fun Club O2 activities available for teens. Planning a family cruise that both grandparents and kids will enjoy is so easy. The opportunities for fun and family bonding are endless. I hope you’ll consider planning a multi-generational cruise with Carnival. I feel pretty certain that you won’t be disappointed! These are great ideas. There are always way to bridge the generation gap when you love each other. These are all great ideas for some family bonding time on a cruise. Shore excursions can be such a neat way for you all to try something new together. I never got to vacation with my grandparents either! My kids got to, though, and I can’t wait to vacation with my grandkids! It looks like you all had a great time on your cruise – with a ship like that how could you not! I would love for our family to get to take a cruise. We would never be able to take my mother though, she gets seasick and nothing seems to help. Looks like you had a blast. These are great ideas. I’ll make sure to take my grand kids when I go on a cruise. It’s a great way to spend quality time with your grandparents. I could see you really had a great time. Sounds like a really neat experience. Thanks for sharing. Awesome idea! I’d have to plan multi-generational activities/travel too. My mom would love to get on a cruise again and we’ll have to plan and do our research as early as now. Love this. I’d like to take my Mom on our next family cruise so she can have a blast with our son. These are all great ideas. I’d love to go on a cruise with the extended family. I think it would be a blast! This is great! I wouldn’t ever be bringing my kiddos grandparents anywhere with us, but this is wonderful for those that do. i know lots like to vacation together! I love cruising with Carnival! I’m heading on a cruise with them in February. This is awesome. 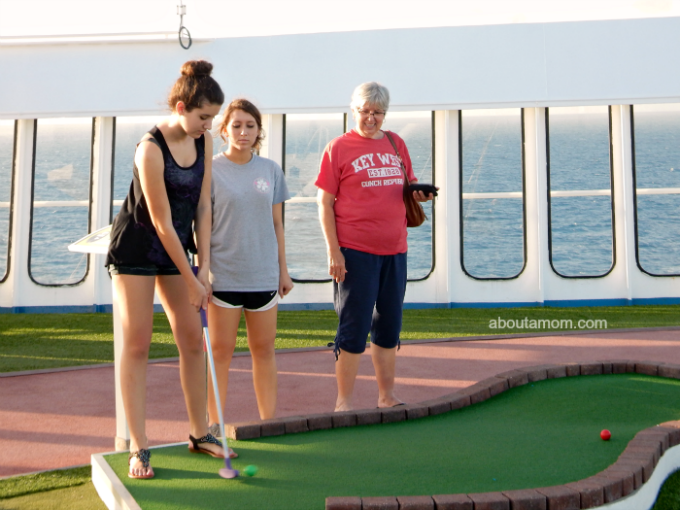 There is tons for grandparents to do on cruises it seems. Where to start is the real question! It looks like there is so much fun to be had on a cruise. I would enjoy going with my family some day! My first cruise was just my grandma and I when I was nine. It was one of my best childhood memories and something I will treasure forever! About 2 years ago we went on a cruise with my dad and 2 sisters. We had 8 kids with us. We all had a great time and I loved that the kids could spend so much time with their grand parents. Carnival cruises sound like so much fun. It’s great that they are so family-friendly. You guys must have had a blast. Oh my gosh, how fun! I agree completely about multi-generational travel. We did a trip a few years ago to Las Vegas and it was perfect; something for everyone during the day and meals together. A cruise would be a fun way to spend time with the whole family. There is something for every age on the boats. I bet my in-laws would love to go on a cruise with our kids. If that ever happens, it’s nice to know that there is something for every age on a cruise! This looks like so much fun! I have been wanting to try a cruise because I think it would be an awesome vacation, but going with grandparents would be even better. I’m definitely going to have to talk to my parents about this! Love that the kids spend time with Grandma. What a great way to build wonderful memories. We live really close to my parents so they get to spend a lot of time with my children. As much as I love that, it’d be extra special to be able to go on a vacation together. Those shared memories are irreplaceable. I need to go on a cruise, this looks like so much fun. Totally something I need in my life. So many great ideas. I wish my grandparents were still alive. I would love to have done more traveling with them! My mom moved in with us about 5 years ago, so every trip we take is a multi-generational trip. We love having my mom with us and watching her make memories with her grandkids. I love all the family friendly activities they offer. It would be fun to do the golfing or the shuffleboard. I would love to do something like this. It looks like a great way for kids and grands to develop their own bonds.